At Budds’, we’re always excited when our favourite brands make the news. And sometimes we get so excited we like to tell you about it. It’s been a busy couple of weeks for GM brands, so that means it’s time for another news round-up. Canadian AutoWorld reports via AutoGuide.com that GM has more in store for Toronto than was originally thought. 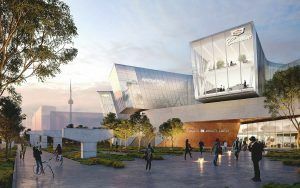 In case you missed it, last year GM Canada purchased land on the lakeshore in east Toronto and announced plans for new offices, a multi-brand dealership and a research and development mobility campus. Turns out there’s a lot brewing on the waterfront. Read more here. Changes are coming to the CTS—some colours are going away, for example, and Satin Steel Metallic makes its debut. But it’s the new infotainment system that has the geeks in us excited. GM Authority touts “a completely redesigned user experience and new features like driver profiles, an all-new navigation app, and a summary screen.” Read more. 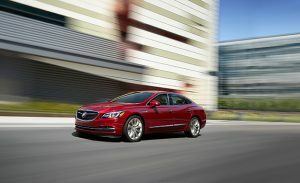 Ward’s has announced its 10 Best Interiors and some are surprised to see the Buick Lacrosse on the list. Not us—we’ve known it was a beauty since the first one rolled onto our lot. You can read more about the Lacrosse interior at wardsauto.com. To make their point they present a list of 10 luxury cars under $US35k—about $45,000 Canadian dollars. Read the full list—although to be honest, we were done at the Encore and the ATS — here on AutoGuide. Read more about the 2018 Buick LaCrosse. Motor Authority has spy shots of the 2019 CTS. The new design appears to borrow from Cadillac’s Escala concept, and rumour has it that both SuperCruise and the new CUE will make an appearance. See for yourself. “[GM] has completed production of 130 second-generation Bolt EVs, fitted with newer, more compact, and more capable sensors and software. We’re still going to have to wait a while to buy a fully automated car—experts predict 2030—but we can’t deny it… The fact that we’ll see them in our lifetime is pretty cool. Learn more about the autonomous Chevy Bolt EV at Green Car Reports. Just in time for Father’s Day, GMC has rolled out a “Dad Like a Pro” ad to reinforce its “We Are Professional Grade” campaign. Have a look for yourself. Sniff. We’d love to see you ‘round up in these parts (we know… Terrible.) If you’ve been itching to get into a new Chev, Buick, Cadillac or GMC, come on by.